My mom loves to try all my new recipes, but she’s always surprised by how much spice and heat tends to accompany our dishes (we often add more spice than I include in the posted recipes). We love spicy food! It’s amazing how a little spice can transform an ordinary dish into an extraordinary dining experience. And that spice is the difference maker in this Kicked-up Cajun Chicken & Rice. Prepare the rice by placing the rice, chicken broth, and salt and pepper in a medium saucepan. Bring to a boil, cover and reduce heat to low. Simmer for 15 minutes, then remove from the heat and set aside to allow the rice to finish soaking up the liquid. Season the chicken with both the Cajun seasoning and the Southwest Sizzler blend (If you can’t handle as much heat, choose one or the other, but the combination is great!). In a large pan, cook the chicken in olive oil over medium-high heat. When the chicken is cooked through, remove from the pan and set aside. Add a little more olive oil to the pan and heat the oil on high. Add the minced garlic and bell peppers and saute until the veggies brown and soften. Add some more Cajun and Southwest Sizzler seasoning. Toward the end of the cooking process add the green onions. 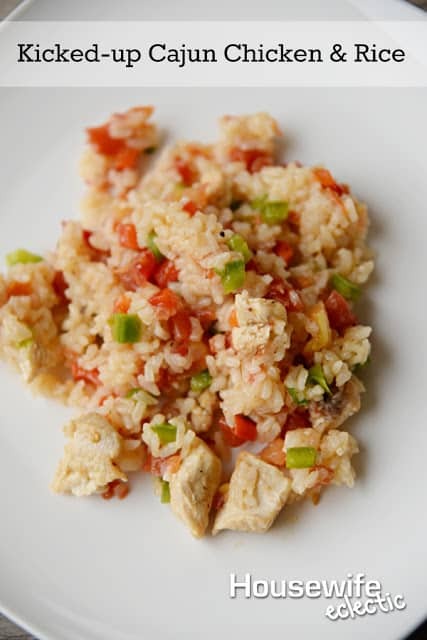 Pour the Ro-Tel tomatoes in with the veggies, and add the diced tomato, chicken, and rice. Stir until well combined. This is no ordinary chicken and rice. The heat is wonderful without being overbearing, and you can control the heat largely by how much you put in. We use a lot, but it’s not so much that our daughters can’t handle it, though they do reach for the milk. It’s a fun twist to a classic staple and it’s a perfect way to spice up your autumn menu. Looks like a fast yet tasty dinner, I will have to try this out! This looks so yummy! I am a chicken and starch girl for sure, so this is right up my alley! It looks so tasty can't wait to make my own veggie version! We love spice in our house too! the hotter the better. Yum yum! My husband would love this. I feel like all of his favorite recipes are "kicked up." Oh how yummy does this look! I am certainly going to try your recipe. Thanks for sharing. Oh this looks so good! I bet it would also be good with some spicy sausage for alittle kick! I think my family, with the exception of my hubs, would balk at the extra spice. Luckily, spices are an easy tweak and this looks like a great recipe! That looks so tasty! I am always on the look out for ways to serve chicken. I will bookmark this for later. Yum! This looks so yummy and easy to make! My husband would love how spice this rice is, but I'm afraid I would have to tone it down for my palette. It looks delicious! This looks delicious!!! I'd love to make it for dinner! omg yes! I definitely want to try this looks so yummy! Omg your rice looks delicious!!!! My hubby hates all things potato so we eat a lot of rice in this house. I will have to give this a try one night! Oh yum!! You're making me hungry!! Thanks for sharing at #HomeMattersParty! !